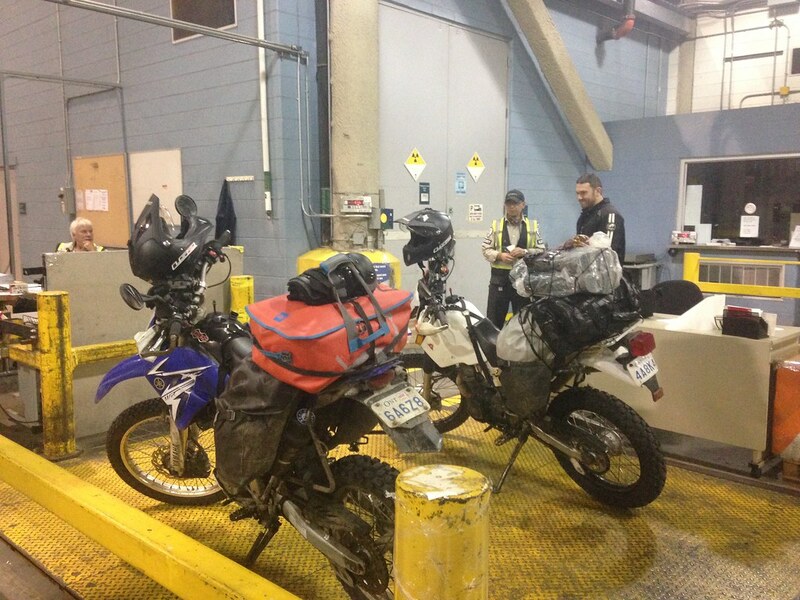 Fully loaded, we rode our motorcycles to the Air Canada Cargo warehouse on a breezy Thursday night. 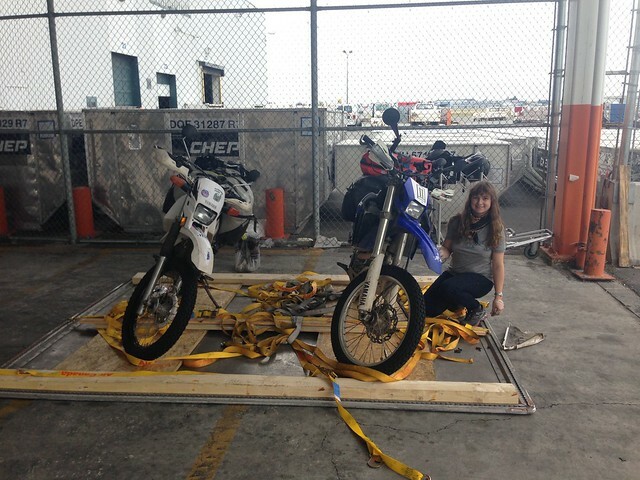 We had to disconnect the bikes’ batteries, but all other crating and handling was left for Air Canada employees to do. The hardest part was waiting for the right people to process the paperwork in the mostly empty warehouse. One Friday and one 5 hour flight later we were sitting in a rather quiet food court of the Vancouver airport and eating our second breakfast. Having spent so much time and energy preparing for this trip we were relieved to be away from home, away from all the familiar things. There was this calm realization that even if we forgot something, it hardly matters any more. There can be nothing more to worry about. This was officially over the rainbow and all anxiety was left behind. We walked to the cargo terminal and a forklift brought out the bikes. Not a scratch on them! [M’s note: at least no new ones.] The forklift operator used to ride a bike too, along the Pacific coast to the States. Had some advice about campsites and stories, which I’m not going to share because if you must know, you’ll have to go to the Air Canada cargo warehouse in YVR yourself. Unpacking is easy. Hook up the battery, hit the throttle, and go! I don’t want to tell you about the Orcas we went to see either, because the Orcas were pissed off and the whole ordeal of whale watching seemed disrespectful to the animals [M’s note: it seemed better in Newfoundland]. Obviously there were some Italian tourists yelling how they want to get closer and how this isn’t worth the money, I totally agree with them. They should have gotten closer and dropped a couple of them tourists in the water, it would have been more educational. Here are a couple of blurry pictures of wildlife seen from the boat. 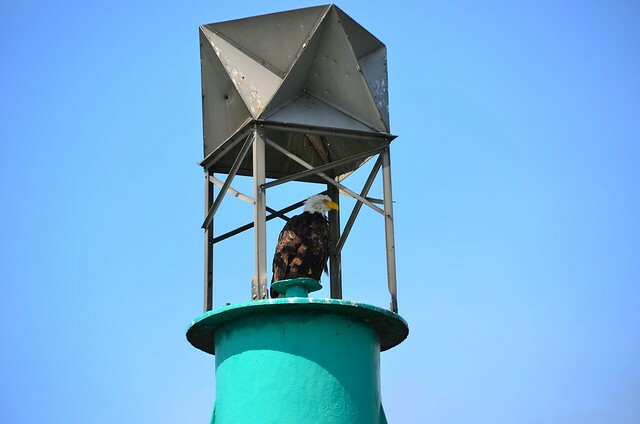 Bald eagles have several nests around the pier, and really like the high vantage points. We spotted several adult birds and one “baby” eagle – which was not a whole lot smaller, but grey in colour instead of the iconic white and brown. Lazy sea lion pretending to be asleep. 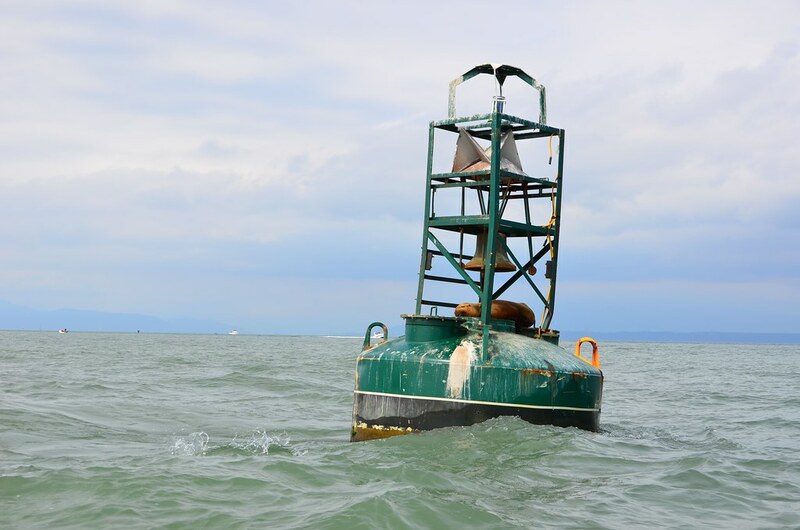 The bell above him kept ringing all the time, but at least he is safe from the carnivorous orcas. 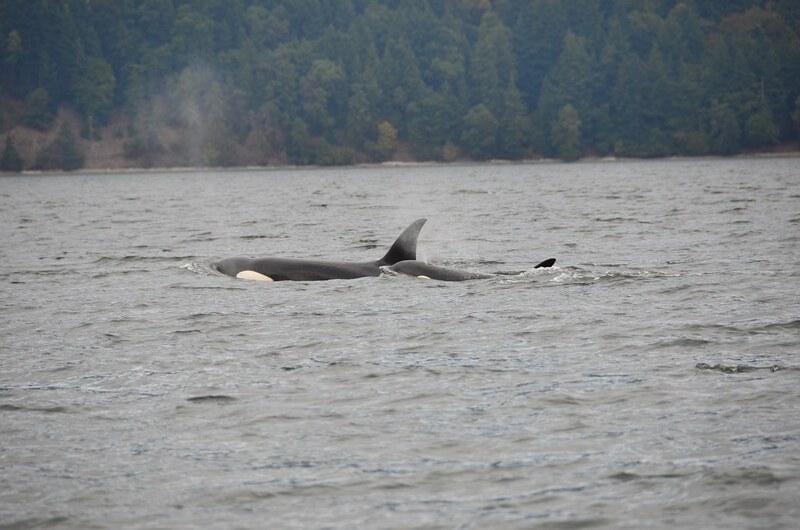 Finally we spotted two groups of transient orcas. A group of 4 and a group of 5. The orcas kept their distance and did their best to not impress us. The tour guide in the meantime was entertaining us with trivia about the animals. Did you know that each killer whale’s dorsal fin is uniquely shaped and can act as an ID? 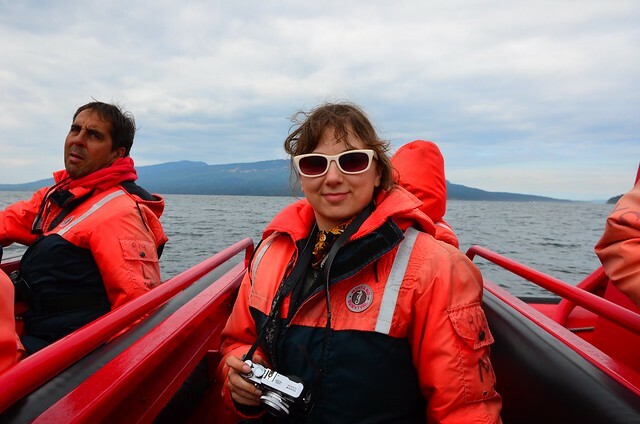 Each boat in the area carries a thick folder with photos of every orca ever spotted. Tour boats and fishermen all track which whales have been spotted, where and when, and help marine biologists do their whale-related science. In a few minutes I will doze off and have weird dreams about orcas on motorcycles. It was actually rather cozy to sleep on the boat, cuddled into the warm hooded suit. Assuming you did not suffer from motion sickness, of course. We originally hoped to pitch a tent in a fellow ADVrider’s backyard, but that fell through, so we stayed at a nearby campground. But hey, at least we got to have awesome seafood at the pier twice that day! Fish and chips, followed by chips and fish. We decided to load up on groceries and head to our camp site. Considering we packed a fridge and a sink, we had no space to put the groceries so I carried the bags on my hands. On a freeway. At night. I was not amused. I asked my trusty partner in the field of navigation to never do that again. We camped in this lame RV place where we managed to unpack and make some tea [M’s note: the most awful campsite was yet to come]. 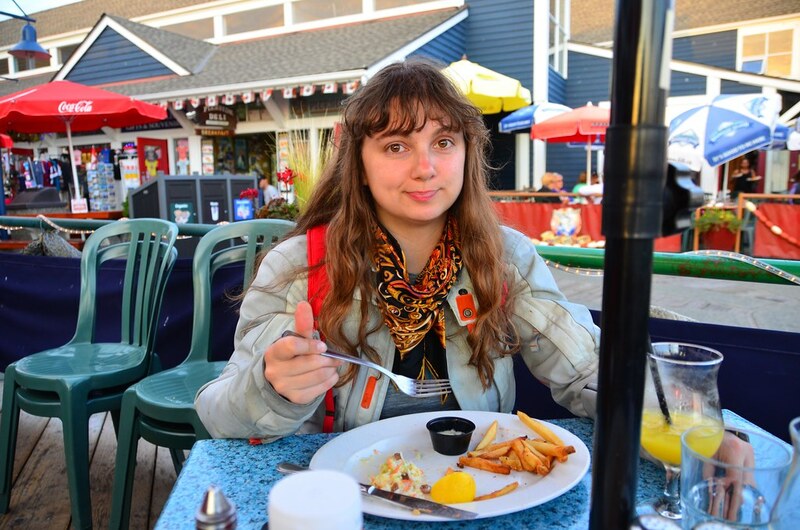 Dinner by the pier. Some people take photos of the pretty food on their just-served plates. I always end up with photos of messy 90% eaten leftovers.